Esgee will present “High-fidelity Multi-Length Scale Modeling of Spacecraft Charging in GEO orbit” at the 15th Spacecraft Charging Technology Symposium 25-29 June, 2018 at the Integrated Research Center of Kobe University in Japan. This study describes high-fidelity modeling of spacecraft charging in GEO orbit environment and the resulting incipient vacuum arcing on the spacecraft’s surface. A satellite in GEO environment is subject to continuous bombardment by highly energetic charged particles that accumulate over time on dielectric surfaces resulting in differential voltages between surfaces. For sufficiently large differential voltages, the electric field at sharp corners or protrusions may exceed the threshold for field electron emission that is accompanied by explosive emission of material from the feature. This event constitutes the start of a vacuum arcing event with resulting damage to the spacecraft structure. In this work, a high-fidelity computational model with unstructured meshing framework is used. 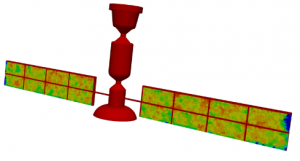 This framework allows of a multi-length scale resolution of small spacecraft features while fully representing the entire spacecraft geometry. The self-consistent electrostatic potential equation is solved in conjunction with particle tracking to resolve electric-field profiles on the spacecraft surface. Further, the effects of a variety of surface electron emission processes (including secondary electron and photoelectron emission) is represented.